With grocery shopping pending for a few days now, I had to prepare lunch with what I had on hand. And, I didn’t have much. I scoured the fridge and put together a ‘Green Sandwich’. Lunch with a theme wouldn’t hurt, after all. Cut zucchini into thin strips and bell pepper into 8. Cut scallions the same size as the other vegetables. Heat a pan and sear the vegetables on high heat for 2 minutes on each side. You can, alternately, grill them. Season them with salt and pepper and set aside. Apply butter to the bread on both sides and toast them. When they are still hot, place the cheese slices on top of the bread and remove from heat. The residual heat from the bread will melt the cheese. Pile the roasted vegetables on top of the cheese. Melt butter in the pan, crack open the eggs and fry them to your desired level of doneness. Season them with salt and pepper and place the fried eggs on top of the sandwich. 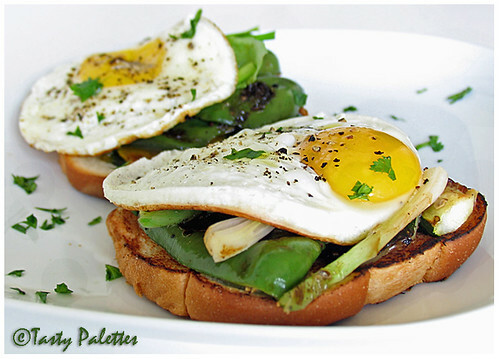 Sprinkle with finely chopped cilantro and enjoy this open faced sandwich when its hot. 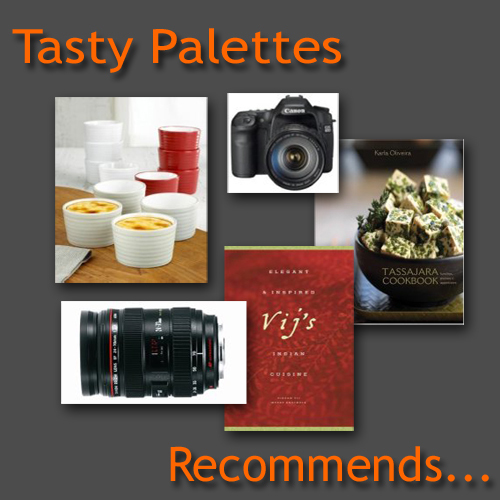 Oh wow - that looks like a fantastic impromtu meal! Very creative! Egg looks absolutely beautiful!!! that's a delicious looking sandwich you have prepared! Appada..at last! !I am familiar with all the ingredients here!! :)..Love the Green sandwich..:)..I tried the swiss traditional dish of Rosti with the same cheese.Got it from swiss itself and that's too good,when melts!! lovely pic! i am actually in love with all your pics :) and the perfect way you have made the eggs! simply superb.. Simple, quick and totally delish. My kinda lunch. I think we are on the same food wave length, Sug! Nice sandwich suganya! but for me with out eggs is ok.
Fried Egg Sandwiches are tasty. I like the idea of adding all these vegetables to it. Great picture as always! Simple and delicious, eggs look so prefect. Happy weekend. Personally I am far too sold out on traditional south indian delicacies. So its unlikely i will ever try these unless circumstances force me to. Healthy sandwich, Suganya! Sunny side looks gorgeous! Ahh, the test of true cook, to rummage up something from a few ingredients and make it tasty not just going down but also to look at. Pic is fantastic, Suganya. very beautiful picture. looks too good. Great looking sandwich Suganya though I cannot bring myself to eat uncooked eggs. It looks so summery though and healthy too. The pic is beautiful. Egg sandwiches are always so tasty & filling. Beautiful sandwich, it really looks like the sandwich from a bakery just outside my house... , and they have the best breakfast sandwiches in the world! Those eggs are too perfect - they must be plastic. ; ) Great, deep-focus shot, Suganya. Lovely lovely photos ! You have creativity running in your veins. wow Suganya, tat pic loooks a fab !!!! I'm hungry now :-) This is my first time to your blog and will keep dropping by for your lovely recipes :-) Have added you to my blogroll. this is amazing and as usal photos r best.can we know little tricks of photography. I am wondering how did I miss this post, I didn't get it in my google reader. But I am glad I found it here... such an incredibly good looking sandwich! I am so happy to see you like sunny side up too! It is rare to find someone who consumes yolk in these days of health overkill! Beautiful Suganya. I amtaking the inspiration to tonights dinner...with home made bread! Oh man. This is fabulous. Simple but looks great. Made this for dinner today and came out very tasty....I love your recipes they r so simple yet yummy!!!! !